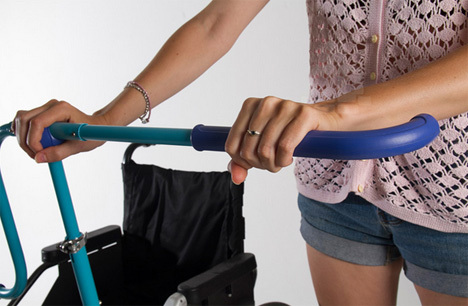 Designer Tammy Kalinsky has come up with a great way to make taking a walk with someone in a wheelchair more enjoyable. The pusher (if necessary) typically stands behind the person being wheeled. Her new invention places them in a more comfortable position. 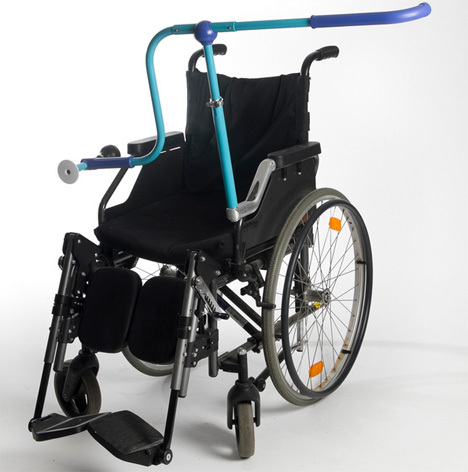 Side by Side is an attachment that fits on most standard wheelchairs and puts the pusher beside the one being pushed. It’s a great tool to increase communication – something hindered by the awkward single-file position that usually takes place. Kalinsky’s original intention was for Side by Side to be used with young people with disabilities, as they frequently require eye-to-eye communication. It features a horn and flashing light to increase interaction. See more in Industrial Design or under Technology. September, 2013.